10 AH 24 volt battery which can source up to 40 amps. Suitable for starting motor batteries. This was designed to work in 24 volt systems instead of using two 12 volt batteries. These can be paralleled, so instead of using two 12V 20AH batteries in series you would use two 24V 10AH batteries in parallel. 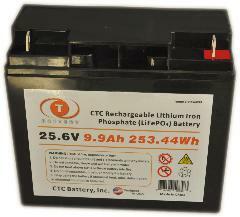 Lithium Iron Phosphate batteries have more charge-discharge cycles than any other battery commercially available. Test data in the laboratory show up to 2000 charge/discharge cycles. Our cells typically have more than 1200 cycles in service. These batteries are excellent for use in electric bicycles, electric scooters and small wheelchairs, and they do not need maintenance during the off season. These batteries can be stored in any state of charge without worry of degradation. (We recommend 50-100% charge before storage.) Another advantage is that running the battery completely down (i.e. getting home on the last bit of fuel) will not damage the battery at all, unlike the SLA and Gel batteries. Note: these can be used in parallel to increase the capacity, but they cannot be used in series to increase the voltage. So this 24 volt battery can replace two 12 volt batteries, and two of the new 24 volt batteries can be used in parallel instead of two 12V batteries in series.